The City of Takoma Park has fully activated its new speed cameras on New Hampshire and Ethan Allen Avenues. These cameras will be operated by ACS State And Local Solutions under a per-ticket fee arrangement signed off in September 2008, and arrangement which included wording designed to ensure the city would turn a profit. Takoma Park Police Chief Ronald Ricucci expressed his view that the cameras were not about revenue when recently quoted by the Gazette "If it'd been for revenue, it would've been up four years ago," (note: the state legislature did not authorize speed cameras until 2006). Ricucci had previously been quoted in the Takoma Voice as saying “I didn’t think we had a speed problem or needed cameras but Mayor [Kathy] Porter asked me to look into it”. Surprisingly, after they looked into it, they arrived at the answer which the mayor wanted. (Note : Mayor Porter was succeeded by Mayor Bruce Williams who was the only candidate on the ballot in 2007). Takoma Park is possibly hoping to get the same financial benefit from its cameras on New Hampshire Avenue as Chevy Chase Village saw with its cameras on Connecticut Avenue. Like Connecticut Avenue, New Hampshire Ave is a 6-lane roadway which runs between I-495 and DC. Like Connecticut Avenue, New Hampshire Avenue is a State Highway which is paid for with money from ALL Maryland taxpayers, yet the decision to install these cameras and the revenue they create will go exclusively to this local government over a locality of 17,300 people. At the county level, County Executive Ike Leggett’s proposed FY10 budget included increasing the number of speed cameras in county from 36 to 66 (60 fixed, 6 mobile) as part of his, and required the cameras to produce $15.7million in revenue. Based on the county receiving a $23.75 share after paying its contractor, that would require at least 661,000 fully paid citations. 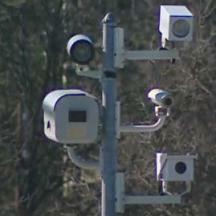 The revenue being produced by each existing camera location dropped in the second half of 2008, in some cases by 40% as drivers learned more about them. Should the cameras fail to generate this large number of citations naturally, they may need to install more cameras or use more aggressive tactics to meet that revenue goal.